Australian Aboriginal dot art styles range from exceedingly neat work to overlapping, unstructured works. The sizes of dots range from tiny dots randomly applied in an area to give a stippled effect to dots placed so close together that they appear to be a line or almost fill in an area with solid color. The Aborigine apply the dots using a paint brush, very thin sticks to make minute dots, or larger sticks to make large dots. To paint our Aboriginal Art Jars we use Q-tips to apply the dots. Not only are Q-tips relatively inexpensive but the size, of the dots made, works well. 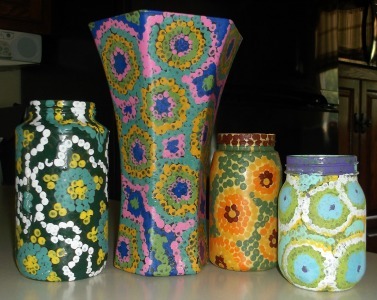 Find the instructions for making the project, Aboriginal Art Jars, under the 6th Grade Projects Gallery in the sidebar. This entry was posted in Categories and tagged 6th grade, aboriginal art, aboriginal dot art, art class, art project, australian, dot art, dot art on jars, dot art project, for kids, jar art. Bookmark the permalink. Hi Dinorah. I used regular acrylic craft paint for this project. What material did you use? Acrylics or special paint for glass?